Traveled Earth » Is Egypt Safe??? When we first realized we could fit a short trip to Egypt into our travel plans, we were a little nervous how our families would react. The post-revolution political situation was rocky at best and our parents typically start fretting about anywhere that sounds remotely dangerous (Mexico, Honduras, and Serbia – which sounds a lot like Syria – topped their list of “Are you sure it’s safe to be there? Call us to let us know you’re still OK!” countries). But when we broke the news to them, they were excited for us. Apparently the images of deserts, camels, and pyramids won out over the revolutionary protests in their collective memories. Excellent. Then, on November 22, Muburak decreed absolute powers for himself and the country broke out into a new round of protests, some violent. The country was making international headlines daily. We were inundated with concerned inquiries from family and friends and were even wondering ourselves whether our December 15 flight into Cairo would still be a good idea. We monitored the situation – things seemed under control and none of the disrest was associated with foreigners. We decided to stick with our plan. We did our best to reassure our parents that we would take it one day at a time and that we wouldn’t knowingly put ourselves in a sketchy situation. 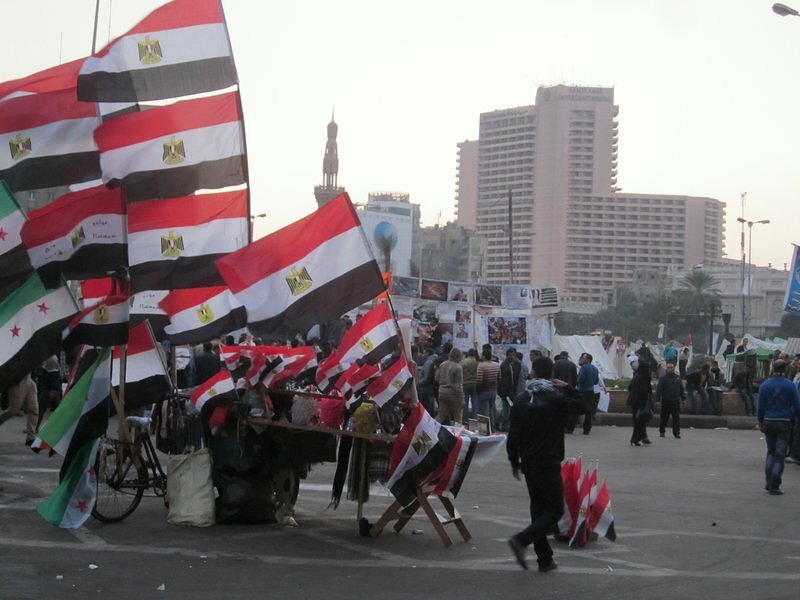 We flew into Cairo on December 15 – the first day of their highly controversial (according to the media, anyways) constitutional referendum. Our flight was delayed nearly two hours, and when we finally arrived at the Cairo airport, we were happy to see that the driver from our hotel was still waiting around to pick us up. He made sure we knew what a big deal it was that he waited and how tired he was, setting the guilt-ridden groundwork for a big tip. On the drive to our downtown hotel, which was located a few blocks from Tahrir Square, we didn’t notice any signs of protests or referendums. It seemed to be business as usual. If you call complete traffic chaos usual, that is. As our driver informed us, there are no traffic regulations in Egypt. There are very few traffic lights and of those, very few actually work. Nor are they followed. The lines on the roads seem to be nothing more than decoration and it seems you gain the right of way by honking your horn the most. So there’s always a mind-shattering, convoluted symphony of horns. I can’t count the number of near collisions we were almost in and there was at least one pedestrian that came inches away from losing his kneecaps at the hands of our driver. Arriving at our hotel, we saw burned out shells of cars littering the street. 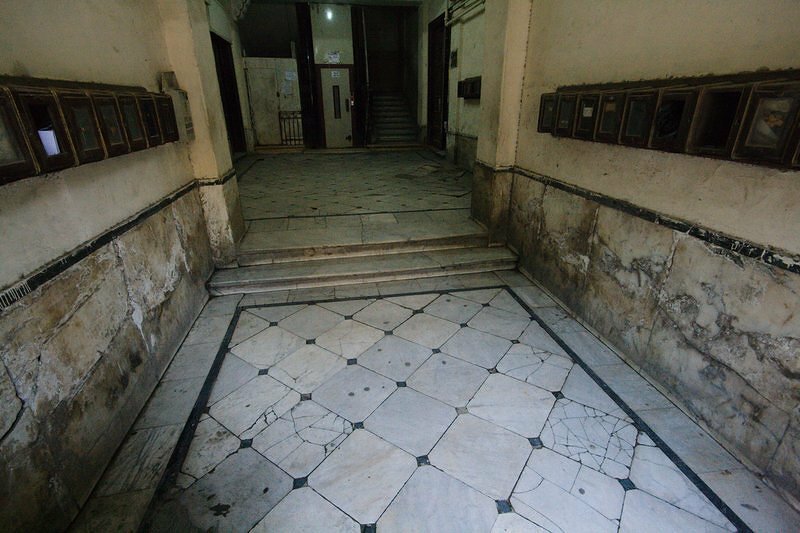 Our hotel was on the 4th floor of a sketchy looking building – it was the kind of place that makes you think twice before getting out of the cab at night. But it was fine. Grungy, dirty, and smelly (I’m talking about both the city and our hotel here), but fine. 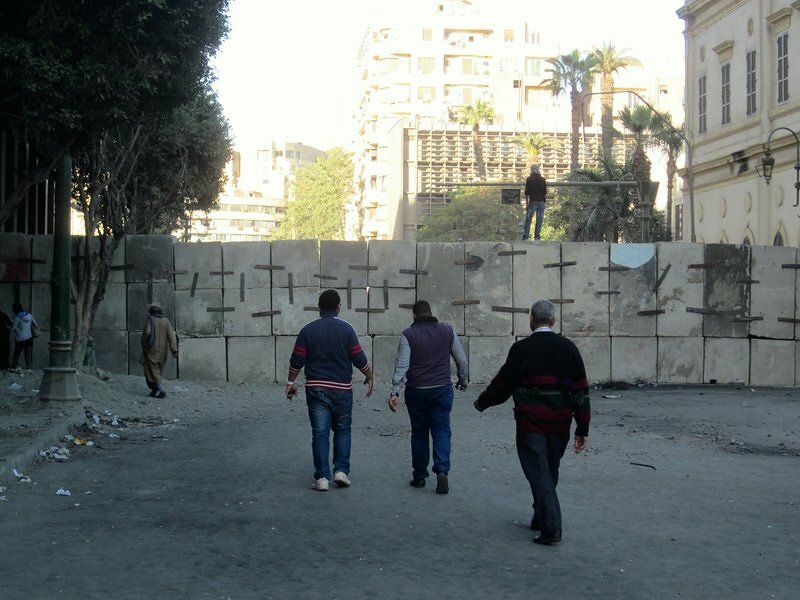 As we explored the city of Cairo, we saw signs of the revolution and protests, but never once felt like we or our property were in danger. We didn’t think twice about pulling out the SLR camera for a photo. While everyone seemed to think that we were walking ATM machines and worked really hard to squeeze out our hard-earned cash, they attempted this through hustles and scams, not violence or threats. 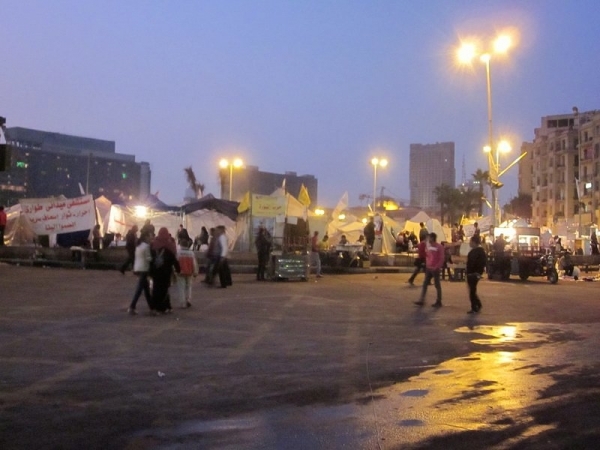 Tahrir Square was still full of protestors camped out. Things always seemed peaceful as we walked by, though it was quite dirty. The nearby streets reeked of urine and other bodily odors, and you sometimes had to dodge human feces on the sidewalks. Metro entrances in the area were often chained shut and equally filthy. Vendors surrounded the square selling flags and food. We even walked through the square at night without problems. As for the “big” referendum, most people we talked to didn’t think it was a big deal. They either weren’t planning to vote or didn’t even know what we were talking about. Most of them lamented about how things “used to be better” – before Morsi, before the revolution, before the tourists left. They dreamed of a stable Egypt. One where tourists weren’t afraid to come and spend their dollars. One where they didn’t have to worry about how they could feed their families. The general consensus was that the revolution was “stolen” from the people by the Muslim Brotherhood. They said if you shave off Morsi’s beard, you just get Mubarak. Same same, but different. No one seemed optimistic about change. Not once in Egypt did we feel unsafe. We came across concrete and barb wire street barricades, but they were easy to bypass on foot. 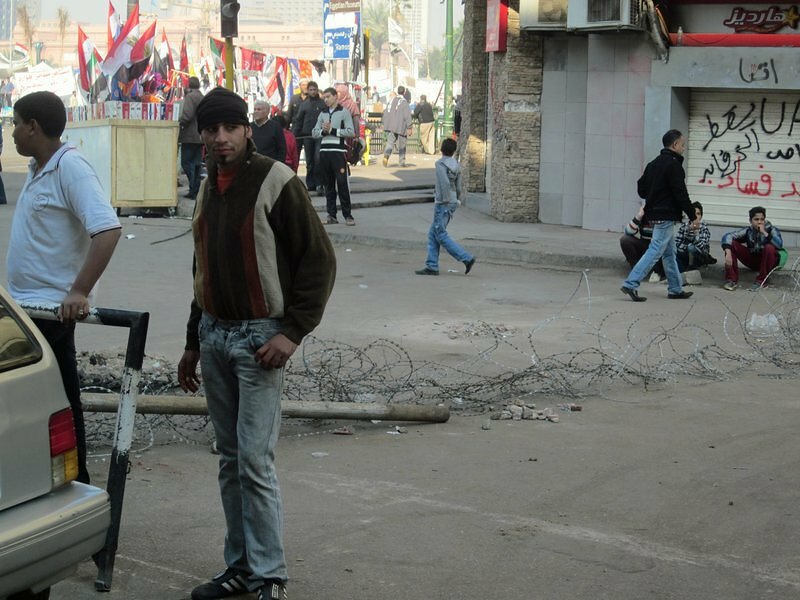 One day, when there was a call for a mass street protest in Cairo, we walked past street after street of military and riot police, fully decked out. But they were sprawled on the sidewalks, laughing and drinking tea… obviously there in case things turned ugly, but there was no tension in the air. If you are thinking about traveling to Egypt, don’t let the imagined fear of the media and people thousands of kilometers away from the country prohibit you from planning it. 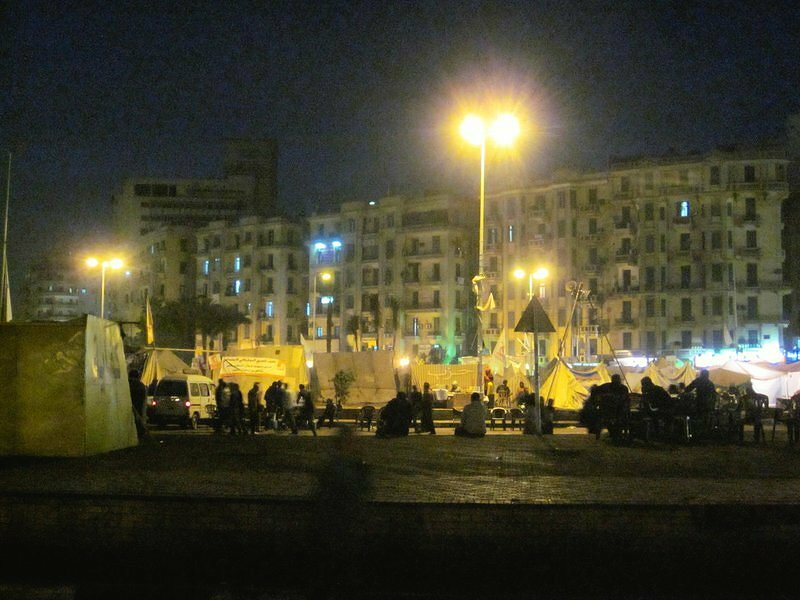 While you should still be smart and cautious, remember that most of what you see on the news is happening in a few, isolated locations (like Tahrir Square and the presidential palace). It’s pretty easy to avoid them if you want. 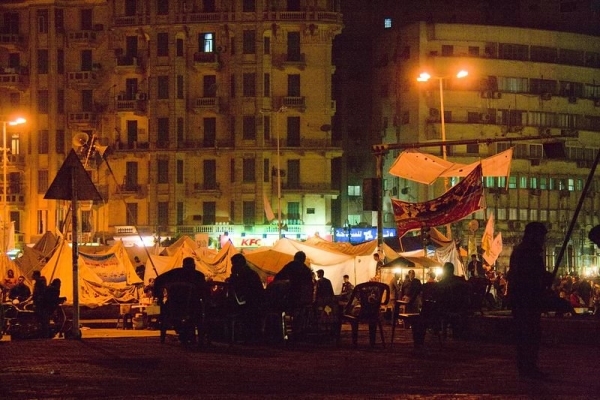 Outside of those places, life is going on like normal for the majority of Egyptians. Instead of letting a few images on the news rule your decision-making, find some travel forums or blogs of people that are actually IN the country. This will give you a much clearer picture of what’s happening (or not happening, as the case may be). Read government advisories, but take them with a grain of salt (they are typically overly pessimistic). And monitor the latest news and political situations, remembering to read between the lines for the truth. When in the country, ask your hotel clerks about places/times you should avoid. While the touts and scammers might be enough to scare me away, the political and social situations are not. After 3 1/2 weeks in post-revolution Egypt, I can honestly stay the scariest experience we had was playing human Frogger as we crossed busy Cairo streets. Well said. I miss playing Frogger in Cairo (the Mandalay version is pretty fun though) and always felt if I died in an accident a great wail would go up from the person that found my body at all the money they weren’t able to scam out of me. After going through my wallet they would put it back intact where they found it and rue the missed opportunities. What a great comment. 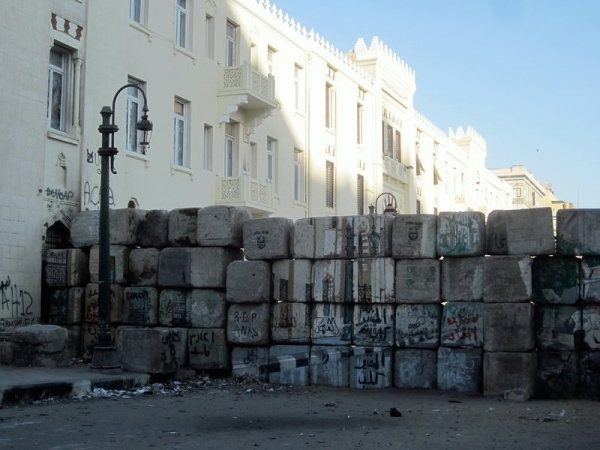 We’ve already quoted it a few time when trying to describe Egypt to new acquaintances. Thanks. Very good article, as we have a potential trip to Cairo coming up in a few months during our 6+ month world adventure, it’s promising to see that not everything we see on the news is as bad as it seems!